This story originally appeared on April 27, 2014. There are few things more British than tea, even if it was originally a Portuguese tradition of brewing South Asian leaves. The culture of tea-drinking permeates British society—including the military. But tea-break culture posed a big problem for the generals in charge of Britain’s armored formations. Tank crewmen had to stop and climb out of their vehicle in order to have a brew, making it difficult to safely sustain an armored advance. The answer was the British Army boiling vessel—a built-in kettle for armored vehicles. The boiling vessel represented an urgent response to one disastrous World War II. On June 12, 1944, just six days after Allied forces stormed the beaches of Normandy, British general Bernard Montgomery ordered the 22nd Armored Brigade to break through the faltering German line and race to the city of Caen. The British force had already lost two Cromwell tanks to a German Panzer IV plus another Cromwell and a Stuart in the town of Livry, but on the morning of June 13, the Brits covered four miles without even glimpsing the enemy. At 8:30 AM, they stopped for morning tea and a spot of maintenance in the crossroads town of Villers-Bocage, 18 miles from Caen. A squadron of the 4th County of London Yeomanry proceeded to a ridge known as Point 213, a mile outside of town. The British officers held an impromptu briefing in a nearby house while the crews of the squadron’s armored vehicles began brewing tea. Just 200 meters away, however, a German Tiger tank watched unnoticed. The tank’s commander was Michael Wittman, a highly-decorated veteran of the Battle of Kursk. Wittman had only just completed a five-day drive from Beauvais. His 12-tank company had winnowed to just four serviceable vehicles. Despite exhaustion and shortages, Wittman immediately recognized the opportunity before him. At 9:05 AM Wittman engaged the British, destroying a Sherman Firefly—the only British tank carrying the 17-pound gun and thus the only immediate threat to the superior Tiger. Wittman’s talented and experienced gunner Balthasar Woll continued firing on the move, picking off three parked Cromwells along the road to Point 213 before extending the one-tank rampage through Villers-Bocage, where the other three Tigers provided reinforcement. The British were caught with their pants down, some quite literally. They scrambled into action. One Firefly crew reversed into a side-street, perfectly positioning to take on Wittman’s Tiger … only to find that the Firefly’s gunner’s seat was empty. They’d left the critical crew member behind. Overall, the British lost 14 tanks, nine half-tracks, four gun carriers and two anti-tank guns in just the first 15 minutes of the battle. 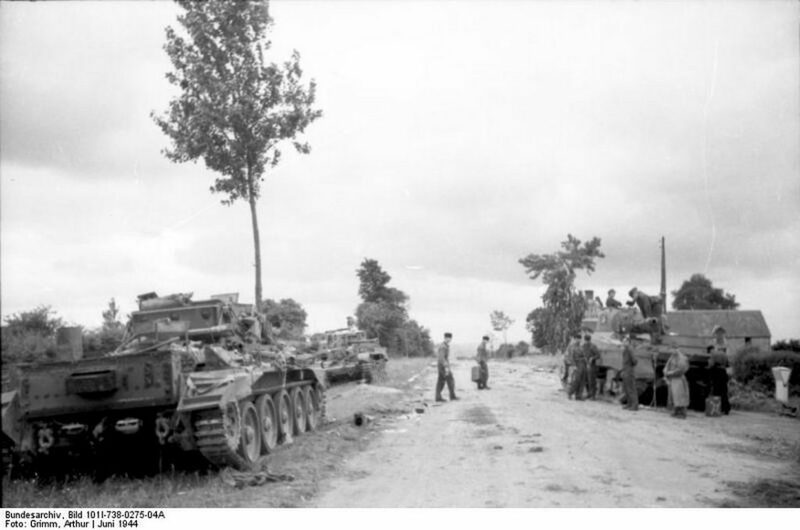 As the most famous example of several such incidents from the North Africa and European campaigns, the Battle of Villers-Bocage highlighted the danger posed by crews having to vacate their vehicles to take a break. In 1946, the British Medical Research Council published “A Survey of Casualties Amongst Armored Units in Northwest Europe.” It found that 37 percent of all armored regiment casualties from March 1945 until the end of the war some months later were crew members outside their vehicles. Being confined to the inside of a tank was a smelly and claustrophobic experience. But the comforts of hot food and drink required open flames that weren’t compatible with the interiors of armored vehicles. The boiler vessel, first fitted to the postwar Centurion tank, changed that. The Centurion design drew from the British Army’s experiences in North Africa. It went on to become one of the most ubiquitous main battle tanks, serving almost everywhere the British had any influence: Iraq, India and South Africa, to name a few countries. The tank came fitted with a boiler vessel, or bivvie—a cuboid kettle powered by the tank’s electrics. The unit became an essential subsystem for all British Army armor. Today the Electrothermal-made “Cooking/Boiling Vessel FV706656” is fitted to all the Army’s main fighting vehicles. The basic concept of the boiling vessel has not changed since the 1950s. The large container quickly boils and maintains the heat of a gallon of water for drinking, washing and heating tinned and retort rations. The unit plugs directly into the vehicle. These days most armored vehicles have auxiliary generators which prevent the vessel draining the batteries. The boiler vessel helps crews to stay in their vehicles for prolonged periods. This is especially important in chemical, biological, radiological or nuclear scenarios. It also eliminates the need for fires inside and outside vehicles—fires that pose a safety risk and could betray a unit’s location. Most importantly, the boiling vessel is an inexpensive piece of equipment that hugely improves morale. Like the Japanese navy’s saltwater baths, it’s a minimalist morale-booster that’s especially suited to a particular culture. It’s catching on. The U.S. Army has added boiling vessels to its Abrams tanks and Bradley fighting vehicles. And other armies across the world are doing the same. They might not be brewing tea, but they like being able to make tank crews a little bit happier and a whole lot safer, whatever their hot beverage of choice.